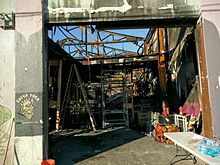 On December 2, 2016, at approximately 11:20 p.m. PST, a fire broke out in a former warehouse, that had been converted into an artist collective known as Ghost Ship, which included living spaces, in the Fruitvale neighborhood of Oakland, California. At the time of the fire, the warehouse was hosting a concert featuring artists from the house music record label 100% Silk. Residential and entertainment uses were forbidden under the warehouse's permits at the time of the fire. 1305 31st Avenue, Oakland, California, U.S.
A total of 36 people were killed in the fire, the deadliest in the history of Oakland. It was also the deadliest building fire in the United States since The Station nightclub fire in 2003, the deadliest in California since the 1906 San Francisco earthquake and the deadliest mass-casualty event in Oakland since the 1989 Loma Prieta earthquake. The Alameda County District Attorney's office launched an investigation into the causes of the fire. In March 2017, emails from 2014 were reported to have described serious electrical problems in the building. On June 5, 2017, Ghost Ship's master tenant Derek Almena and his assistant Max Harris were arrested and charged with felony involuntary manslaughter in connection with the fire. On July 3, 2018, both pleaded no contest to thirty-six counts of involuntary manslaughter in a plea agreement with prosecutors. On August 10, 2018 the judge overseeing the case discarded the plea deals and the pair will now face trial where they could get life imprisonment, if convicted by a jury. The 9,880-square-foot (918 m2) converted warehouse, known as Ghost Ship, was home to an artist collective, which worked and lived there. It was informally known by the tenants as Satya Yuga. At the time of the fire, residents were hosting a concert featuring artists from house music record label 100% Silk, and other independent musicians. Around 50 people were present in the building at the time of the fire. An early report attributed the fire origin to a refrigerator, but this cause was rejected by agents from the federal Bureau of Alcohol, Tobacco, Firearms and Explosives, although agents initially left open the possibility that it was started by another electrical appliance or component. Max Ohr, creative director of the artist collective, said the collective had reported electrical problems to the owner of the building. The fire began on the first floor and spread quickly, and individuals on the second floor were initially unaware of it. Multiple factors prevented the fire's discovery, impeded the escape process, and led to the eventual loss of life. There were no fire sprinklers in the building, and firefighters on scene heard no smoke detectors. The building was cluttered with furniture, pianos, art, and mannequins, most of which were wooden. Oakland Fire Department Chief Teresa Deloach Reed told reporters, "It was like a maze almost." There were two stairways, one in the back and one near the front, but neither led directly to an exit. The second floor stairway was concealed behind contents and furnishings. The front stairway, made from a pile of stacked wooden pallets, was initially reported as the building's only stairway. Only a few people on the second floor were able to escape. They had to crawl along the floor to avoid the smoke filling the building, and struggled to find the front door because of the complicated layout and the clutter blocking the passages. A large number of victims were trapped on the second floor by smoke filling the stairs and because the pile of pallets used as the front stairs was likely burning. 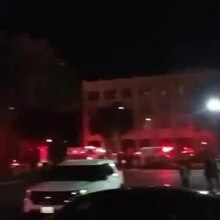 The first firefighters reached the warehouse at 11:27 p.m. It took five hours for 52 firefighters, using 14 pieces of apparatus, to extinguish the blaze. Firefighters initially pushed 25 feet inside the building, but dense smoke and a debris-littered floor made further access dangerous. A total of four fire companies went inside in an attempt to attack the fire and find survivors, but were withdrawn after they reported that the second floor was well ablaze and the roof was threatening to collapse. Oakland Fire Department Search and rescue personnel deployed drone aircraft using thermal imaging that unsuccessfully searched for survivors after a roof collapse made entering the scene unsafe. Of the five musicians scheduled to perform at the concert, two—headliner Golden Donna and Aja Archuleta—were confirmed to have escaped the fire. The other three musicians on the bill—disc jockey Nackt (Johnny Igaz), electro-industrial performer Joey Casio (Joseph Matlock) and house music artist and radio host Cherushii (Chelsea Faith Dolan)—were killed. Seventeen-year-old Draven McGill, who sang in the Pacific Boychoir, was the youngest fatality of the fire, and 61-year-old Wolfgang Renner, a musician who played the electronic keyboard, was the oldest. Of the deceased victims, all but one were visitors to the warehouse. A criminal investigation into the fire was launched by the Alameda County District Attorney's Office on December 4. An arson investigation was also launched. Oakland Mayor Libby Schaaf said charges against anyone found responsible could range from involuntary manslaughter to murder. A report published on February 8, 2017, was inconclusive, noting that the investigation was ongoing and that the electrical system was part of the analysis. In public remarks on January 23, 2017, lawyers for Ghost Ship founder Derick Ion Almena claimed that the fire originated in a building adjacent to the warehouse, and that Almena should not be held responsible. On March 14, 2017, Oakland Fire Department Chief Teresa Deloach Reed tendered her retirement. The lead prosecutor from Alameda County in charge of the investigation had been requesting the city fire department's report on the fire for several weeks when he finally received a copy on March 17. Its contents were not released to the public. On March 21, 2017, a judge ruled that all debris from the fire must be preserved as potential evidence in pending lawsuits. The East Bay Times reported on March 24, 2017, that the son of the building owner wrote an email about electrical problems to Derick Almena on February 15, 2015. The Times stated that Almena illegally sublet living space to other artists within the warehouse. They found emails showing that Almena had complained to the owner's son that electricity in the building used "ancient and violated lines of distribution" that were "in dire need of a total and immediate upgrade." The paper reported that an electrician who was currently unlicensed had performed repairs in 2014. He found ungrounded subpanels and "deferred maintenance dating back decades requiring immediate intervention." He reported to the owners that a single 7.5-kilovolt transformer meant for lighting was being used for three businesses in spaces owned by Ng, exceeding its capacity. An attorney representing victims' families stated, "They were on notice that there was problems with the electricity." The Oakland fire department, Bureau of Alcohol, Tobacco and Firearms, and the Alameda County Arson Task Force issued a report on June 19, 2017 about the fire. It stated that all 36 victims died of smoke inhalation. Only one person was seriously injured but not killed. The sheriff's office said, "It appears that people either made it out [safely], or they didn't make it out." It took three days for investigators to recover all of the victims from the building. They removed the fire debris in five-gallon buckets as they sifted through the collapsed second floor. The debris included wooden pallets, statues, piles of furniture, mobile homes, and mannequins. The makeshift hallways on the first floor were constructed of "aggregates of salvaged and scavenged materials, such as pianos, organs, windows, wood benches, lumber, and innumerable other items stacked next to and on top of each other." The live-work spaces were separated by a variety of things, including "wooden studs, steel beams, doors, window frames, bed frames, railings, pianos, benches, chairs, intact motorhomes and trailers, portions of trailers, corrugated metal sheeting, tapestries, plywood, sculptures, tree stumps and tree limbs." Investigators concluded that the fire originated in the northwest area of the ground floor, but were unable to pinpoint the cause of the fire due to the extreme damage to the building and its contents. On July 3, 2018, Almena and Harris each pled no contest to 36 counts of involuntary manslaughter in connection with the fire. According to their agreement, Almena was to be sentenced to nine years in jail, and Harris to six. Some family members of those who died in the fire testified and protested the plea deal. Sentencing was set for August 9. But on August 10, 2018, the judge in the case threw out the plea deals, citing that Derick Almena didn't accept "full responsibility and remorse" for the fire that killed 36 people. Almena and Harris now face life imprisonment if convicted by a jury or if a new plea deal is not reached. The judge said that he would have accepted the plea deal for Harris because Harris showed remorse but the plea deal was made with both Almena and Harris. The building was constructed in 1930, and was once part of a milk bottling plant, and later a warehouse for metal pipes. The property was purchased in 1988 by Chor Ng, who is linked to 17 other properties in the San Francisco Bay Area. Before the fire, the building had already been under investigation by the Oakland Planning and Building Department for "blight" and "illegal interior construction". Complaints of hazardous garbage and construction debris around the building had also been made. Ng rented the property to the final lease holder, Derick Almena, in 2013. At least ten complaints had been filed about the property since 1998, the most recent on November 13 and 14, 2016. City building inspectors visited the warehouse on November 17, but left when no one answered the door. Inspectors are required to obtain permission from owners to gain entry, and when that fails, must seek a court order. A spokesperson for the Planning and Building Department noted that an event like the concert on December 2 would have required a special permit, but none had been issued. The City of Oakland's planning director revealed that the building had not been inspected for three decades. Although the building's owner did not intend the warehouse to be a housing accommodation for any of the artists, the city is investigating whether people were living in the warehouse illegally. Ng stated that no one lived in the building, according to a translation by her daughter Eva. However, neighbors reported that it appeared that people were living in the building. One victim, Peter Wadsworth, was a building resident. Although police and fire officials warned that the warehouse was a fire hazard, the Ghost Ship's founder, Derick Ion Almena, allegedly did not respond to these concerns. Almena has stated that he, his wife, Micah Allison, and his three children had slept inside the warehouse. Residents and others reported that he lived with his wife and children on the second floor and rented space to as many as 18 others who lived in recreational vehicles and makeshift rooms on the first floor. The vice president of the local firefighters union said that the fire marshal's office had been understaffed for years, and that a fire inspector seeing the conditions of the Ghost Ship "would have shut the place down". Adding to the discussion, on December 13, the Oakland Fire Chief said "there were no indications this was an active business", that there are no city records showing her department had received complaints about the building and that the department "inspects businesses, not buildings". In an interview, Oakland City Council member Noel Gallo said that city officials "need to enforce the codes that we have" and that "we should have been more assertive in the past." The Oakland Athletics baseball team offered to match donations for those affected, up to $30,000; the Oakland Raiders football team soon joined them. The Oakland-based Golden State Warriors basketball team announced a donation of $50,000 to the Fruitvale-based Unity Council. The Warriors announced an additional $75,000 donation to relief efforts on December 7, 2016. Warriors player Stephen Curry auctioned off two pairs of his shoes for $45,201 to benefit the Oakland Fire Relief fund. By December 9, 2016 the Gray Area Foundation for the Arts had raised over $550,000 and scheduled a benefit concert for December 14, 2016, featuring Bay Area musicians such as Primus, Tune-yards, and Boots Riley. A Facebook Safety Check was deployed in early December 2016 to help people find the whereabouts of friends and family who might have been in attendance. On December 3, 2016, the record label 100% Silk posted on their Facebook page: "What happened in Oakland is an unbelievable tragedy, a nightmare scenario. Britt and I are beside ourselves, utterly devastated. We are a very tight community of artists and we are all praying, sending love and condolences to everyone involved and their families." After the fire, in early December 2016, a man identified as the Satya Yuga collective's founder, Derick Ion Almena, posted on Facebook that the fire had destroyed his warehouse. This post was criticized by several other Facebook users, who noted that the collective's founder had not mentioned anything about the people killed or injured in the fire. Almena later clarified his comments, stating, "In my previous Facebook post, I had no idea there was loss of life." In a brief interview on December 5, he spoke of the families of the victims, saying, "They're my children. They're my friends, they're my family, they're my loves, they're my future." In another interview on December 6, Almena said he was "incredibly sorry" and defended himself against charges of profit-seeking, saying, "This is not profit, this is loss. This is a mass grave." On the night of December 5, 2016, hundreds of people attended vigils in Oakland and San Francisco, in honor of the victims of the fire. Local residents, including artists and tenants' rights activists, have cited the fire as a symptom of the San Francisco Bay Area's underlying housing crisis. City inspectors have voiced suspicions that dozens of live-work warehouses similar to Ghost Ship exist in Oakland. On December 6, 2016, Mayor Libby Schaaf announced $1.7 million in grant funding to create affordable spaces for artists and arts organizations. She announced a planned revival and expansion of a task force on Artist Housing and Work Spaces, and the creation of a fire safety task force. On December 23, 2016, the parents of two of the victims of the fire filed lawsuits in Alameda County Superior Court. People named in the lawsuit included the building owner, the primary tenant, the event promoter, and a performer at the event. Comparisons were drawn between this fire and the 1990 Happy Land fire, a nightclub fire in New York City that claimed 87 lives. The Happy Land fire also involved controversial operations of the structure, and suffered from similar conditions including lack of emergency exits and poor maintenance. In June 2017, local artist Chris Edwards built a boat sculpture in memory of Ghost Ship and installed it in the nearby Emeryville harbor. People have used it as a place to visit and leave flowers. ^ Veklerov, Kimberly (June 19, 2017). "Ghost Ship report shows investigators found fire origin, no cause". San Francisco Chronicle. Retrieved June 19, 2017. ^ a b c d e f g Hamed Aleaziz; Kevin Fagan (December 7, 2016). "Search of Oakland warehouse finished as fire death toll remains 36". San Francisco Chronicle. Retrieved December 7, 2016. ^ Dan Simon; Steve Almasy; Max Blau (December 3, 2016). "Oakland fire kills at least 9 at warehouse party". CNN. Retrieved December 7, 2016. ^ a b c Prodis Sulek, Julia (December 11, 2016). "Oakland fire: The last hours of the Ghost Ship warehouse". East Bay Times. Retrieved December 12, 2016. ^ Wallace-Wells, Benjamin (December 13, 2016). "What Happened, Exactly, in Oakland's Ghost Ship Fire?". The New Yorker. ^ Hermann, Andy (December 4, 2016). "Update: 100% Silk Artists Cherushii and Nackt Among Confirmed Victims of Ghost Ship Fire". LA Weekly. ^ a b c Kevin Fagan; Hamed Aleaziz (December 6, 2016). "Quirky Ghost Ship leader: 'I am incredibly sorry'". SFGate. Retrieved December 6, 2016. ^ a b Thomas Fuller; Conor Dougherty; Julie Turkewitz (December 4, 2016). "Death Toll in Oakland Warehouse Fire Rises to 36 as Search Continues". The New York Times. Retrieved December 7, 2016. ^ a b c Julia Prodis Sulek; Erin Baldassari; Matthias Gafni; Tracy Seipel (December 3, 2016). "Oakland fire: 24 bodies recovered from warehouse, search on for more". The Mercury News. Retrieved December 3, 2016. ^ Kristin J. Bender; Brian Melley (December 5, 2016). "Death toll grows to 36 at Oakland warehouse fire". Associated Press. Retrieved December 5, 2016. ^ Phil McCausland (December 4, 2016). "'Ghost Ship' One of Country's Deadliest Building Fires in Half-Century". NBC News. Retrieved December 4, 2016. ^ "Oakland fire: Dozens feared dead in club night blaze". BBC News. December 4, 2016. Retrieved December 4, 2016. ^ Sernoffsky, Evan; Veklerov, Kimberly; Fimrite, Peter (June 5, 2017). "Ghost Ship: authorities arrest two in deadly fire that killed 36". San Francisco Chronicle. Retrieved June 5, 2017. ^ a b c "Oakland Ghost Ship fire defendants reach plea deal, will avoid trial". ABC7 San Francisco. July 3, 2018. Retrieved July 4, 2018. ^ "Judge Rejects Plea Deal; Orders Ghost Ship Fire Defendants To Stand Trial". August 10, 2018. Retrieved August 11, 2018. ^ "Final list released of 36 victims of Ghost Ship fire in Oakland". San Francisco Chronicle. December 9, 2016. Retrieved December 9, 2016. ^ Staff Los Angeles Times (December 9, 2016). "Victims of the Oakland warehouse fire: Who they were". Los Angeles Times. Retrieved October 2, 2017. ^ a b Alex Johnson; Andrew Blankstein; Stephanie Gosk (December 5, 2016). "Oakland Warehouse Fire: 'Ghost Ship' Sailed Through Regulators' Fingers for Years". NBC News. Retrieved December 5, 2016. ^ Olga R. Rodriguez. "Warehouse gutted by blaze was home to Bohemian art space". U.S. News and World Report. Retrieved December 3, 2016. ^ Seth Kelley (December 4, 2016). "Oakland Fire Kills at Least 36 at Record Label Warehouse Party". Variety. Retrieved December 7, 2016. ^ a b Randall Roberts (December 4, 2016). "Oakland concert struck by deadly fire featured artists on L.A. dance label 100% Silk". Los Angeles Times. Retrieved December 7, 2016. ^ "Source of Oakland warehouse fire may have been refrigerator". KTVU. December 3, 2016. Retrieved December 7, 2016. ^ a b Daniella Silva (December 4, 2016). "Oakland Warehouse Fire Survivors Describe Escape From Blaze as Confirmed Death Toll Rises to 33". NBC News. Retrieved December 6, 2016. ^ a b c "Deadly fire at Oakland's "Ghost Ship" spread quickly, trapped victims upstairs". CBS News. Retrieved December 8, 2016. ^ a b Liam Dillon; Ben Poston; David Zahniser; Laura J. Nelson (December 4, 2016). "Oakland warehouse was a cluttered 'death trap' filled with pianos, RVs, but no fire sprinklers, former residents say". Los Angeles Times. Retrieved December 4, 2016. ^ "Oakland fire: Dozens feared dead in club night blaze". BBC. December 6, 2016. Retrieved December 23, 2017. ^ a b "Origin and Cause Report Incident # 2016-085231" (PDF). Oakland Fire Department. March 18, 2017. Retrieved June 23, 2017. ^ Russ Mitchell; Peter H. King; Liam Dillon; Tracey Lien; Paige St. John (December 3, 2016). "Officials fear up to 40 dead in fire during concert at Oakland warehouse". Los Angeles Times. Retrieved December 7, 2016. ^ a b Ford Fessenden; Anjali Singhvi (December 12, 2016). "The Oakland Fire: What Happened Inside the Ghost Ship". The New York Times. Retrieved December 12, 2016. ^ a b c Rhea Mahbubani; Jessica Rice (December 3, 2016). "At Least 9 Killed, Dozens More Feared Dead After Fire Rips Through Oakland Warehouse Party". NBC Bay Area. Retrieved December 7, 2016. ^ a b Elizabeth Weise; Aamer Madhani (December 4, 2016). "Authorities: More than 2 dozen may be dead in Oakland warehouse fire". USA Today. Retrieved December 7, 2016. ^ "FHWorld18: Commander Shares Lessons from Ghost Ship Fire". FIREHOUSE. March 8, 2018. Retrieved March 13, 2019. ^ Rory Carroll; Peter Henderson (December 3, 2016). "California warehouse fire kills at least nine at dance party". Reuters. Retrieved December 7, 2016. ^ "Electronic Artist Headlining Oakland Rave Survived Fatal Fire". CBS San Francisco. December 3, 2016. Retrieved December 7, 2016. ^ Julious, Britt. "Death Toll in Massive Oakland Warehouse Fire Rises to 33 | Thump". Thump. Vice. Retrieved December 18, 2016. ^ Hogan, Mark. "Cherushii and Nackt, Two 100% Silk Artists, Confirmed Dead in Oakland Fire". Pitchfork. Retrieved December 7, 2016. ^ Steve Rubenstein (December 6, 2016). "Chelsea Dolan, musician and radio host, among victims of Oakland warehouse fire". SFGate. Retrieved December 6, 2016. ^ Yoo, Noah. "Oakland Artist Joey Casio Confirmed Dead in Ghost Ship Fire | Pitchfork". pitchfork.com. Retrieved December 9, 2016. ^ Jill Tucker (December 5, 2016). "Draven McGill, 17, was the fire's youngest victim". SFGate. Retrieved December 6, 2016. ^ Rubenstein, Steve (December 7, 2016). "Wolfgang Renner, 61, was oldest victim of Oakland fire". San Francisco Chronicle. Retrieved December 12, 2016. ^ Rubenstein, Steve; Veklerov, Kimberly (December 9, 2016). "Ghost Ship's resident genius, Peter Wadsworth, was only Oakland fire victim who lived in warehouse". San Francisco Chronicle. Retrieved December 12, 2016. ^ a b Rick Hurd; Matthias Gafni; Julia Prodis Sulek; Erin Baldassari; Traci Seipel (December 4, 2016). "Oakland warehouse fire: 8 of 33 victims identified, criminal investigators on scene". The Mercury News. Retrieved December 9, 2016. ^ Bodley, Michael (January 23, 2017). "Lawyers: Deadly Oakland fire didn't start in Ghost Ship warehouse". San Francisco Chronicle. Retrieved January 23, 2017. ^ Gafni, Matthias; Debolt, David; Peele, Thomas (March 15, 2017). "Oakland Fire Chief Teresa Deloach Reed Retires". San Jose Mercury News. Digital First Media. ^ Davis, Aaron; Gafni, Matthias; Peele, Thomas (March 20, 2017). "Oakland turns over Ghost Ship investigative report to DA". Retrieved March 25, 2017. ^ Peele, Thomas (March 24, 2017). "Dumped Ghost Ship fire debris could be evidence, judge says". East Bay Times. Retrieved March 25, 2017. ^ "Ghost Ship victims died huddled in rugs, says new Oakland fire report". The Daily News. Associated Press. June 21, 2017. ^ Davis, Aaron; Gafni, Matthias; Peele, Thomas (March 24, 2017). "Ghost Ship owners knew of dangerous electrical system before deadly fire". East Bay Times. Retrieved March 25, 2017. ^ Kimberly Veklerov (March 3, 2017). "Ghost Ship fire victims died of smoke inhalation, coroner says". San Francisco Chronicle. Retrieved March 3, 2017. ^ Tim Bontemps; Kristine Guerra; Ana Swanson (December 4, 2016). "'They were trapped in this inferno': Oakland officials fear dozens are dead in fire". The Washington Post. Retrieved December 7, 2016. ^ "Judge throws out plea deal in deadly 'Ghost Ship' warehouse fire". NBC News. Retrieved August 11, 2018. ^ a b Fuller, Thomas; Turkewitz, Julie; Alcindor, Yamiche; Dougherty, Conor; Kovaleski, Serge F. (December 22, 2016). "Why the 'Ghost Ship' was all but invisible, until fire killed 36". The New York Times. ^ Liz Wagner; David Paredes (December 4, 2016). "Family of Woman Who Owns Oakland Warehouse Sends Condolences". NBC Bay Area. Retrieved December 5, 2016. ^ a b Elizabeth Chuck; Ali Gostanian; Rebecca Sai; Erin Calabrese (December 3, 2016). "At Least 9 Dead, More Missing After Fire During California Warehouse Party". NBC News. Retrieved December 3, 2016. ^ Sam Levin; Alan Yuhas (December 3, 2016). "Oakland warehouse party fire leaves nine dead and 25 missing". The Guardian. Retrieved December 9, 2016. ^ Paige St. John (December 3, 2016). "Officials preparing for up to 40 fatalities in Oakland warehouse fire". Los Angeles Times. ISSN 0458-3035. Retrieved December 4, 2016. ^ Jill Tucker; Rachel Swan; Erin Allday; J.K. Dineen (December 4, 2016). "Oakland building where fire victims died was source of complaints". San Francisco Chronicle. Retrieved December 4, 2016. ^ Paige St. John (December 3, 2016). "Owner of Oakland warehouse says no one lived in building, daughter says". Los Angeles Times. Retrieved December 5, 2016. ^ a b Veronica Rocha; Phil Willon; Paige St. John; Soumya Karlamangla (December 6, 2016). "Investigation into Oakland fire intensifies: Search to continue until 'every piece of debris is removed'". Los Angeles Times. Retrieved December 9, 2016. ^ Steve Rubinstein; Kimberly Veklerov (December 9, 2016). "Ghost Ship's resident genius, Peter Wadsworth, was only Oakland fire victim who lived in warehouse". San Francisco Chronicle. Retrieved December 9, 2016. ^ Dan Noyes (December 4, 2016). "Ex-employees say Ghost Ship founder disregarded fire hazard warnings". ABC7 San Francisco. Retrieved December 9, 2016. ^ "NBC News paid for Ghost Ship operator's hotel room". SFGate. Retrieved December 8, 2016. ^ "Chief: Fire Department Unaware of Oakland Warehouse Concerns". The New York Times. Associated Press. December 13, 2016. ISSN 0362-4331. Retrieved December 15, 2016. ^ "33 Confirmed Dead in Oakland Warehouse Party Fire; 8 Victims Identified". KQED. December 4, 2016. Archived from the original on December 5, 2016. Retrieved December 9, 2016. ^ Oakland A's (December 3, 2016). "THANK YOU to every Oakland A's fan for helping us support our community". Retrieved December 9, 2016 – via Twitter. We will now match to $30,000. ^ Oakland A's (December 3, 2016). "The @RAIDERS are joining us in relief of the #OaklandFire and will also be matching and donating up to $30,000". Retrieved December 9, 2016 – via Twitter. ^ "Warriors make $50K donation to support victims of Oakland fire". ESPN. December 3, 2016. Retrieved December 9, 2016. ^ Connor Letourneau (December 7, 2016). "Warriors to donate additional $75,000 to Oakland Fire relief". San Francisco Chronicle. Retrieved December 8, 2016. ^ Connor Letourneau (December 30, 2016). "Stephen Curry's shoes raise $45,201 for Oakland Fire Relief fund". San Francisco Chronicle. Retrieved December 30, 2016. ^ Kaye, Ben (December 9, 2016). "Tune-yards, Dan Deacon, Primus to Play Benefit Show for Oakland Fire Relief Fund". Consequence of Sound. ^ Brandon Mercer (December 3, 2016). "Facebook Safety Check activated for Oakland Inferno that killed 9, and left 25 missing". San Francisco Chronicle. Retrieved December 9, 2016. ^ "100% SILK Facebook post". December 3, 2016. Retrieved December 9, 2016 – via Facebook. ^ Olga R. Rodriguez (December 3, 2016). "Warehouse Gutted by Blaze Was Home to Bohemian Art Space". ABC News. Associated Press. Retrieved December 9, 2016. ^ Thomas Peele; Robert Salonga (December 4, 2016). "Oakland warehouse fire: Who is the man behind the 'Ghost Ship'?". San Jose Mercury News. Retrieved December 9, 2016. ^ Jason Silverstein (December 4, 2016). "Operator of California 'Ghost Ship' warehouse complains about losing his venue in deadly fire". Daily News. New York. Retrieved December 4, 2016. ^ Tim Bontemps; Jasper Scherer; Kristine Guerra; Michael Kranish (December 5, 2016). "Investigators search for answers as death toll reaches 36 in Oakland warehouse fire". Washington Post. Retrieved December 9, 2016. ^ Lilian Kim (December 5, 2016). "EXCLUSIVE: Ghost Ship warehouse founder speaks on deadly fire". KGO-TV. Retrieved December 5, 2016. ^ Eun Kyung Kim (December 6, 2016). "'I'm not going to answer these questions': Oakland warehouse manager Derick Almena anguished in interview". Today. Retrieved December 9, 2016. ^ Michael Bodley (December 6, 2016). "Vigil in SF mourns transgender victims of Oakland fire". San Francisco Chronicle. Retrieved December 9, 2016. ^ Michael Bodley (December 6, 2016). "Oakland mayor booed at Lake Merritt vigil for fire victims". San Francisco Chronicle. Retrieved December 9, 2016. ^ Sam Levin (December 5, 2016). "Oakland warehouse fire is product of housing crisis, say artists and advocates". The Guardian. Retrieved December 9, 2016. ^ Sam Stecklow (December 4, 2016). "Don't blame artists for Oakland's warehouse fire, blame the Bay Area's housing crisis". Fusion.net. Retrieved December 9, 2016. ^ Rachel Swan (December 6, 2016). "Among Oakland's dozens of artist warehouses is one called Deathtrap". San Francisco Chronicle. Retrieved December 9, 2016. ^ Katrina Cameron (December 7, 2016). "Oakland fire: Mayor announces $1.7 million grant to help artists". East Bay Times. Retrieved December 9, 2016. ^ Aaron Davis; George Kelly; Harry Harris; Rick Hurd (December 7, 2016). "Oakland: Ghost Ship Fire deadliest in the U.S. in 13 years". East Bay Times. Retrieved December 8, 2016. ^ Kimberly Veklerov (December 23, 2016). "Families of 2 Oakland warehouse fire victims file 1st lawsuits". San Francisco Chronicle. Retrieved December 30, 2016. ^ "Oakland Fire Grim Reminder of Deadly Happy Land Blaze in 1990". NBC New York. December 7, 2016. Retrieved December 9, 2016. ^ de Guzman, Dianne (June 7, 2017). "Artist creates actual Ghost Ship as tribute in Emeryville". SFGate. Retrieved April 3, 2019. ^ Arias, Rob (June 7, 2017). "Ghost Ship memorial 'docked' in Emeryville Marina Cove". The E'ville Eye Community News. Retrieved April 3, 2019. "Final list released of 36 victims of Ghost Ship fire in Oakland". SF Gate. December 9, 2016.